← How to convert files of AutoCAD to tga? This article will give you three steps to convert AutoCAD to ppm with the help of docPrint which is one application of docPrint Document Converter Professional( docPrint Pro). docPrint is a virtual printer but acts as a document converter when you convert AutoCAD to ppm format file. 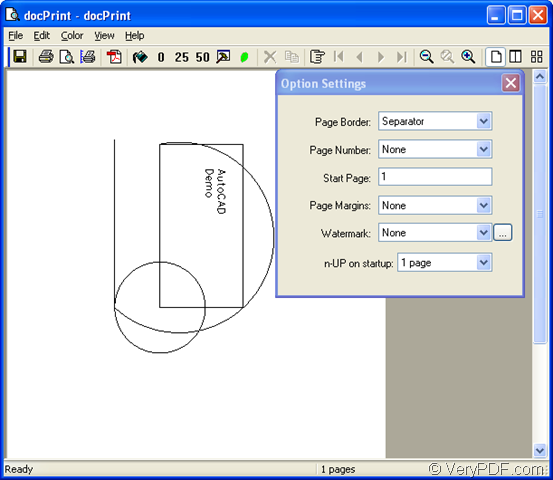 There are two other applications of docPrint Pro—GUI version and command line version. You can choose anyone of them. Before learning how docPrint works, we can learn what is docPrint Pro first. docPrint Document Converter Professional is a software product that dynamically converts MS Office 97/2000/XP/2003/2007, WordPerfect, AutoCAD DWG, PostScript, Adobe Acrobat PDF and many other document types to Adobe Acrobat PDF, PostScript, EPS, XPS, PCL, JPEG, TIFF, PNG, PCX, EMF, WMF, GIF, TGA, PIC, PCD and BMP etc formats. With docPrint Document Converter Professional you can convert your documents from and to 50+ formats easily. If you want to download docPrint Pro, please click on the link http://www.verypdf.com/artprint/docprint_pro_setup.exe. It is an executable file and you just need to double click the file to install it in your computer, which is easy enough and you can do it well. In the end of the installation, you can set docPrint as the default printer, which is recommended because it will save you a lot of work time. Step1. Please open the dwg file in your computer by double clicking on it or right clicking and clicking “Open” option. Then click “File” – “Plot” or use the hot key “Ctrl” + “P” to open the dialog box “Plot-Model”. You should choose “docPrint” as your printer in “Name” combo box of “Printer/Plotter” group box and click “OK” button if you don’t set docPrint as default printer. If not, you don’t need to open dwg file, just right click it with your mouse and click “Print” to run the printer driver. Press “Ctrl”+ “S” on the keyboard. Step3. Then you will see a new dialog box titled “Save As” comes out. Please follow the steps below to fulfill the conversion of AutoCAD to ppm. Please see Figure2. 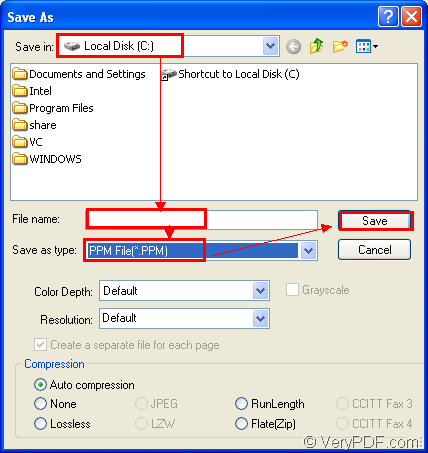 Find a location in your computer for the target file in “Save in” combo box. Edit a good name for the output file in “File name” edit box. Choose a file type for the target file in “Save as type” combo box in which you can see many kinds of output formats. Run the conversion and save all the changes by clicking “Save” button. You can get your target file in a short while and you can browse it by some kind of viewer such as Photoshop, IrfanView, GSview and so on. If you’re interested in docPrint Pro, you can visit http://www.verypdf.com/artprint/index.html to see its introduction or you can read other articles about docPrint Pro at the blog http://www.verypdf.com/wordpress/. How to keep my files well-ordered? How to combine multiple images to single PDF? 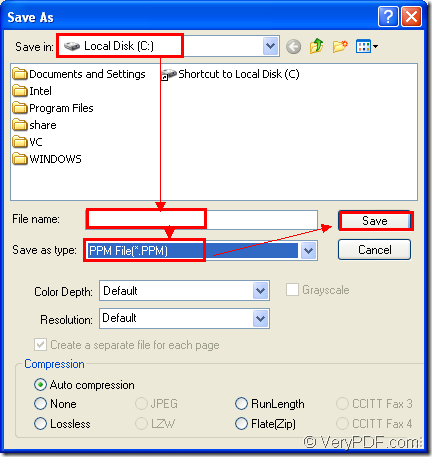 How to convert HTML file on local disk to PDF file?